''A body just fell from the sky onto Hollywood Boulevard. Another thrilling read from Carey Baldwin. My fingers were itching to get my hands on 'Fallen' after having been introduced to Caitlin and Spenser in 'Judgment.' I had high hopes as I was so impressed with the first in the series. 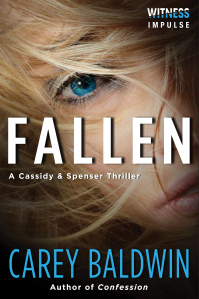 'Fallen' went beyond my expectations and the Cassidy & Spenser series is now a firm favourite. The author teases the reader with the slow romance between the protagonists. With every lingering look and touch, the reader can't help but fall in love with them as they fall in love with each other. Their developing relationship is left to simmer however, as more pressing matters take centre stage when the pair are called in to profile a serial killer in Hollywood. The 'nail biting' mystery and suspense had me completely engrossed and the twists and turns kept me guessing until the very end. I really had no clue until Cassidy figured it out. The killer in question is a completely new kind of character for me. The psychology and twisted reasoning behind it was intelligent and thought provoking. I can't wait to read what Ms Baldwin comes up with next.